Across the globe, there’s a need to encourage university students to pursue an education in broadcasting. This entails more than just concepts and theory; a well-rounded broadcast education is one that prepares students with technical training and hands-on skillsets, which they need to confidently enter the workforce. Calrec has seen many recent installations of its consoles and audio networking solutions in educational establishments. This is for several reasons: the widely recognized popularity of its technology across the industry globally; the small form-factor, power and cost-effectiveness of its Brio range (although other consoles have been deployed too); and the sheer quality of the sound. Take the case of the University of Surrey, UK, which recently upgraded its television studio with a Calrec Brio36 as a key part of a major refurbishment. Professor Tony Myatt, Head of the Department of Music and Media, described Calrec’s Brio as being “the obvious choice as industry leaders in the field.” Students there are taking advantage of the Brio’s networking capabilities by expanding its connectivity via an additional I/O box. This includes inputs for a MADI card, which connects the Brio to the facility’s main audio studio, and a Dante card to teach students audio over IP, which is a very important aspect in professional audio. Brio is “designed very well both in usability and audio engineering terms. Having the external I/O box allows our students to see the Hydra2 network in action and set up their own routing and clean feeds”, added Alan Haigh, Programme Director, Film and Video Production Technology at the University of Surrey. Though Brio is compact in size, it doesn’t compromise on functionality or features. Brio is available with a 36-fader dual layer surface (the Brio36) or with a 12-fader dual-layer surface (the Brio12). 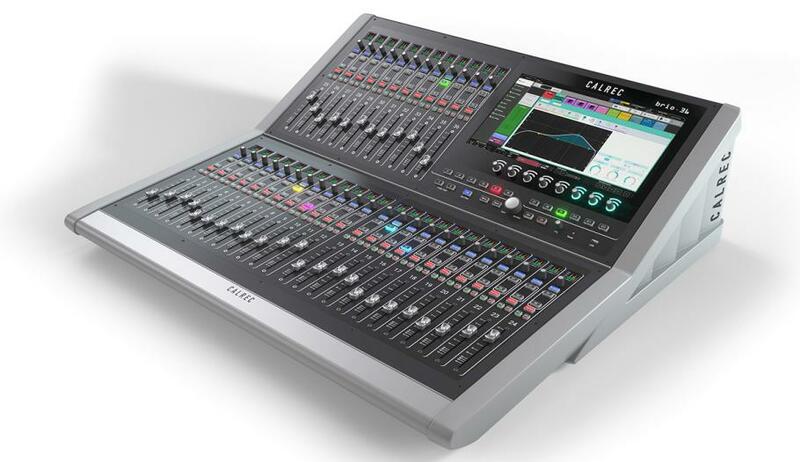 Both models provide more faders in a given footprint than any other comparable audio console. Coupled with this is the Brio’s budget-friendly price point, which gives it an edge over the competition. This was the main reason that Chapman University’s Dodge College of Film and Media Arts chose the Brio — for its value compared to price. “Of course, price was a factor, and we needed a board that could handle the complexities of our news and narrative curriculum,” noted David Goedhart, the school’s Television Studio Engineer. At Chapman, the Brio is a key player in a busy television production schedule, and Goedhart said it has exceeded the school’s expectations. “I can honestly say it’s the best audio mixer I’ve ever used at this price point. It’s intuitive, powerful, and full of great features. Best of all, Brio is giving our students fantastic hands-on experience with an industry-standard tool they’ll be encountering in the real world of broadcasting,” he commented. For students at Husson University’s New England School of Communications (NESCom) in Bangor, Maine, the Brio, along with accompanying Summa console also from Calrec, are giving students real-world audio mixing experience. “With the Summa and the Brio, we’re able to give students a head-start on the equipment they’ll be using in their jobs after graduation,” said Edward Goguen, Assistant Professor, Academic Director, and Audio Programs Coordinator at NESCom. At Husson, the Brio is in use for NESCom’s studio productions, including the NESCom Connection, a daily news and public affairs TV program produced by the school’s video production and journalism students. In service since 2015, the Summa is used in broadcasts of live sporting and entertainment events. Goguen said that the school appreciates Calrec’s commitment to broadcast education in making state-of-the-art tools like the Brio so affordable, adding that “while it’s good for the school and the program, the students are the real winners”. Further illustrating Calrec’s commitment to education is the Brio’s role in producing live sports for the broadcast team at SoonerVision, which is the in-house video production arm of the University of Oklahoma (OU) Department of Intercollegiate Athletics. With an Artemis console already in place, the school took its production one step further by purchasing a Brio, which produces thousands of hours of sports content annually. The school says the Brio’s robust faders, ease of use, and the outstanding ergonomics of the screen layout — in a compact and affordable package — are perfect for the types of shows it produces in its smaller studio. SoonerVision produces content for Sooner Sports TV, the university’s multiplatform network covering 12 varsity sports, including football, men’s and women’s basketball, baseball, and gymnastics. If you’re a university or educator interested in learning more about the Brio digital audio console, please don’t hesitate to contact us here. 8 x Reasons your School needs a Brio. How your broadcast educational programme will benefit. Download today.